Croatia was the ultimate surprise of the FIFA World Cup 2018, the biggest sporting event on the planet. In a competition of 32 football superpowers, nobody expected that a small nation of 4 million people will be taking home the silver medal. We did a media analysis to see what it meant for the country. Having winning sports teams in small countries is a rarity. Countries like Croatia lack money, establishments and have a smaller pool of talent from which to choose top athletes. Croatia is the smallest country since Uruguay to be in the finals, and Uruguay achieved that in 1950 when there were only 12 countries competing. In fact, Croatia is so small people use Google to find out not only where it is, but in which country. Talk about lack of brand recognizability. So we decided to measure how much exposure Croatia as a country got thanks to this sporting event and the corresponding impact it had on the country’s recognizability. To understand why, it is important to know that a staggering 18 percent of Croatia’s GDP comes from tourism. This is the highest percentage among European countries. The Croatian National Tourist Board’s annual budget for advertising is around $9 million. Nike spends $195 million annually just on sponsoring ten World Cup teams. So while to countries that already have a strong international presence additional exposure may not mean much, to Croatia it is everything. The world knows France for the Eiffel Tower and Paris, England for London and its Queen, but for reasons of primarily budget constraints – Croatia has so far remained largely unknown. This World Cup presented a unique opportunity to raise awareness about the country’s existence. To break the first barrier of every marketing campaign: brand recognisability. The media coverage was limited at the beginning of the tournament. The world was indifferent throughout both the group stage and the knockout round – probably because there were a lot of other teams competing. But when Croatia moved past Denmark to face off Russia in the quarterfinal, this changed. Croatia went from having approximately 100 daily mentions to more than 150,000 mentions after the match. Just when we thought the numbers couldn’t get any bigger, the semi-finals against England proved us wrong. Croatia beat England, resulting in more than 300,000 articles in the aftermath of the game. And then Croatia, a small country from the Balkans, made it to the final of the World Cup. More than a billion people tuned in to watch the match between France and Croatia. Over 3,4 billion people watched at least one minute of one match. More than 400,000 articles mentioning Croatia. Over the course of the entire competition – more than a million. This is more online exposure than Croatia had in its entire history. 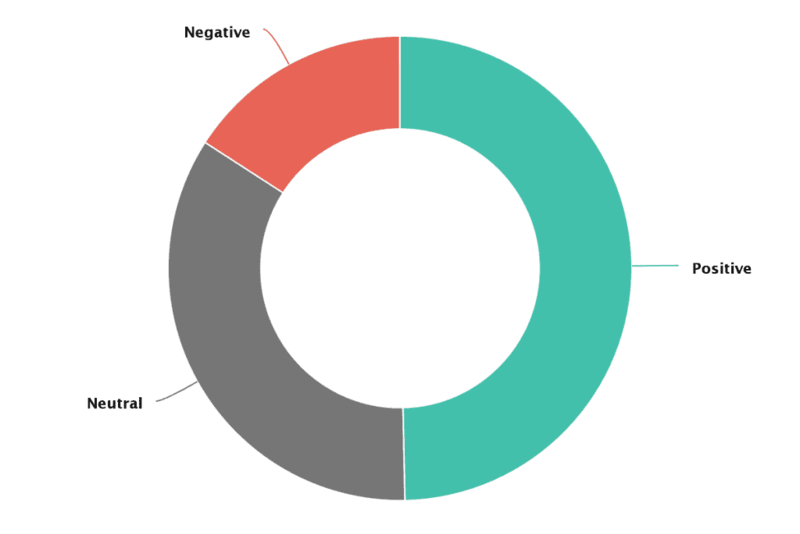 Out of those million, a staggering total of 50% were positive in sentiment towards Croatia, another 35% were neutral and only 15% were negative. Brands regularly cash-out massive sponsorship deals to be associated with the hard work, sportsmanship and beating all odds at the high-profile sports events like World cup. Nike and Adidas, this year’s sponsors of athletes, invested more than 100 million dollars each to sponsor the World Cup. The media share garnered from that partnership is praiseworthy. A social listening company Talkwalker calculated that brands were mentioned approximately 70,000 times on social media during the World Cup. In comparison, as the Croatian football team played in the final, there were a whopping 1,5 million (1 500 000) tweets about Croatia. It was the second most popular topic after the World Cup final. You have a most ADORABLE president. I was DELIGHTED at seeing her greet the #Croatian players. To me, you are the BIGGEST WINNERS of the 2018 #WorldCup. It's made me want to visit Croatia one day. A huge achievement to your country & president. God bless you all! Croatia gained additional exposure with Kolinda Grabar Kitarović, the Croatian president who won the public eye both in Croatia and abroad with her heartfelt cheering for Croatian football team. In the crowd of grey suits and white shirts, she stood out in the national red and white during the medals ceremony. The social media found her peculiarity refreshing – more than 80% of mentions being positively intoned. 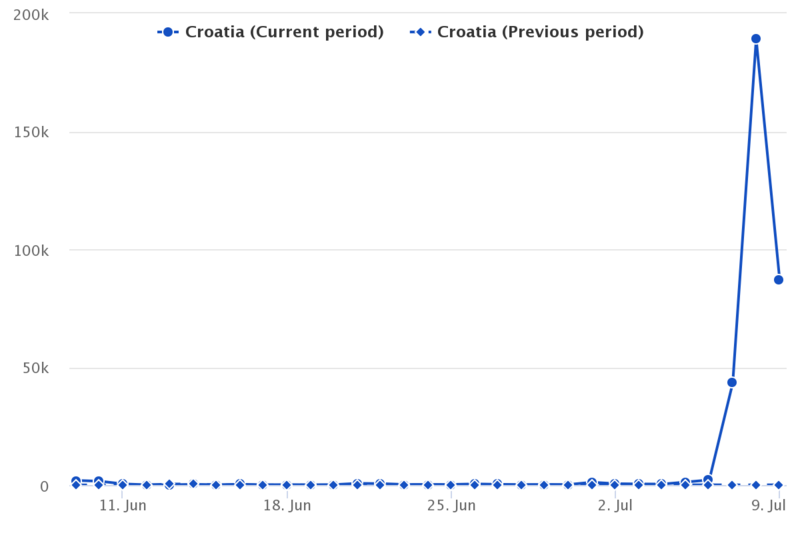 In addition to Mediatoolkit, Google Trends has also shown a drastic increase of interest in Croatia. Looking at the search term, we see it reached an all time peak in July 2018. Between 7th and 15 July 2018 there has been a historical rise in the interest not only for the term Croatia, but also for the term “Visit Croatia”. Since tourist promotion works a year in advance, we will have to wait at least a year to see whether there were any concrete increases in the number of new visitors to Croatia. 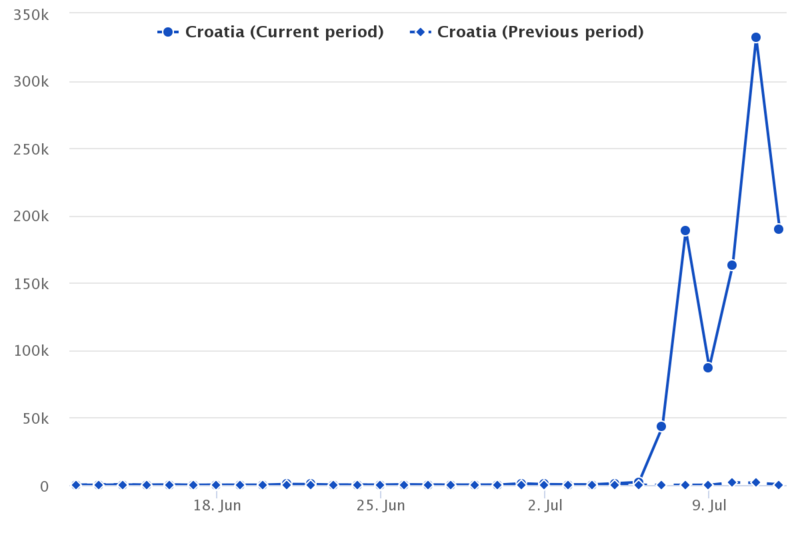 However, the Croatian National Tourist Board is already seeing some positive impact: they reported visits to their website increased by 250% during the World Cup. We measured a total number of 60 billion impressions on global websites for the term Croatia during the World Cup. That is something brands can only dream about. Even the largest global campaigns usually rack up no more than 3 billion impressions. But it is also important to pay attention to the context: Croatia was the underdog and played several highly dramatic matches, winning three in added time (120 minutes vs 90 minutes). Two matches ended up with penalty shootouts. The sheer physical effort it takes to play an extra 30 minutes often results in sports pundits proclaiming the team to be “too tired” for the next match. In the three matches, Croatia also overturned the result and went from losing 1:0 to winning the entire match. During the tournament, Croatia played a total of 90 minutes of extra time. This is something that has never been seen before. The country became the “darling” of the social media, known for its bravery, courage, and determination. Combine the sportsmanship with the underdog position and you have a winning story. There were also several other stories to take into account. One was the emotional story about Luka Modrić’s childhood. He lived as a war refugee and overcame all odds to become one of the world’s best football players. 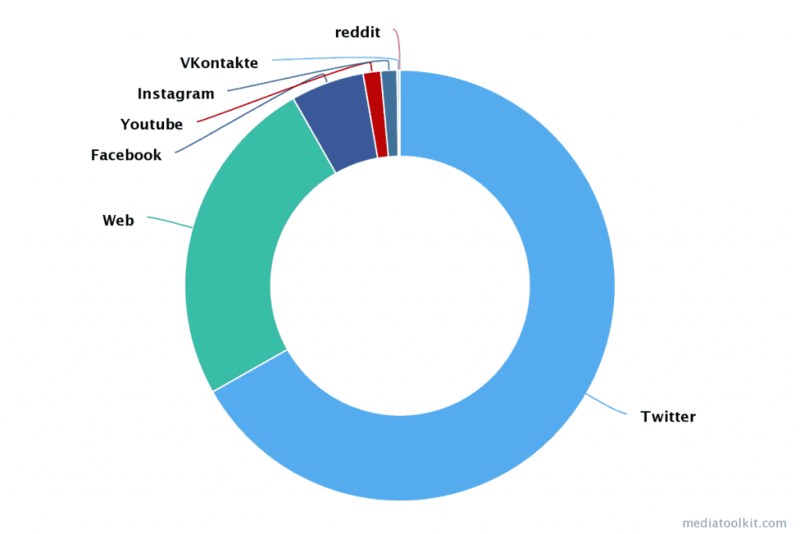 Our data shows that more than 80% of all the mentions about Croatia were positive. The tourism office will be more than glad to hear that, since their promotional video also includes our new source of pride, the footballers. Sports fans will want to know what is it about this country. Measuring the impact sports make worldwide, and the return on investment in sports might finally be clear. We were glad to contribute. Get your own media-data insights. 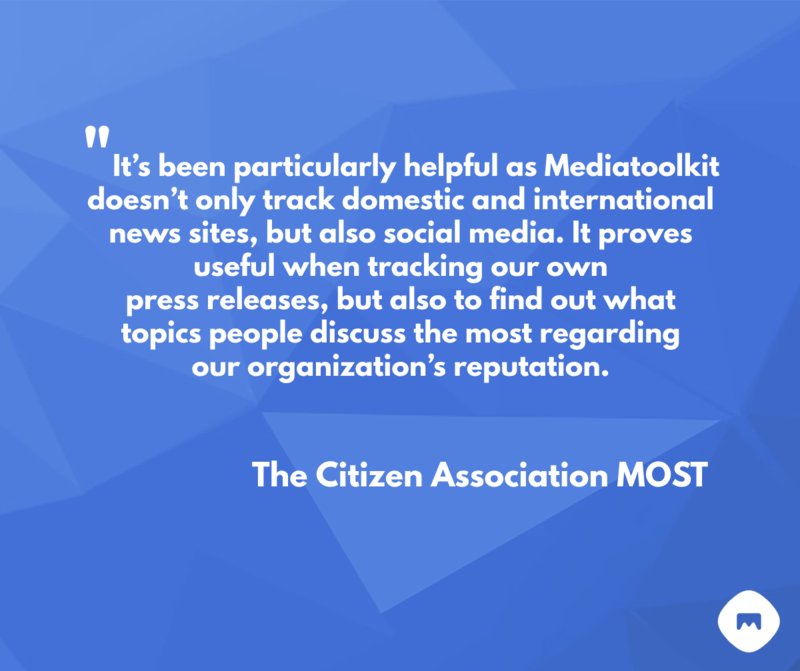 Try Mediatoolkit for free.